Before Aaron Martens can make a cast, he has to paint a mental picture of what lies beneath the surface. Hot Seat: In what will become a continuing series, we're going to sit down with different pros and go through their tackle selections for each day of the tourney, one at a time. 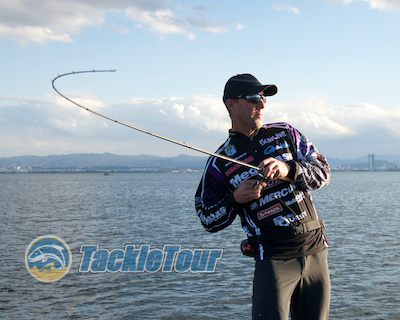 Today, we sit down with Aaron Martens, 2013 BASS Elite Series Angler of the Year. Martens sponsors include Gamakatsu, Kaenon Sunglasses, Megabass, Mercury Motors, Motorguide, Phenix Boats, Simms, and Sunline. 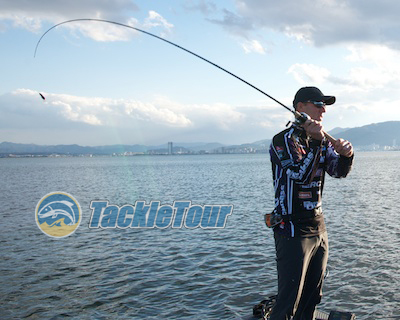 We share some time with Aaron Martens talking about tackle and our imaginary tournament during a recent trip to Lake Biwa, Japan. Once he's dialed in, it's time for some fun and games. Martens's go to cranking setup right now is the Megabass F4.5-711GTA Ultimate Cranking stick matched with a Shimano Metanium casting reel. 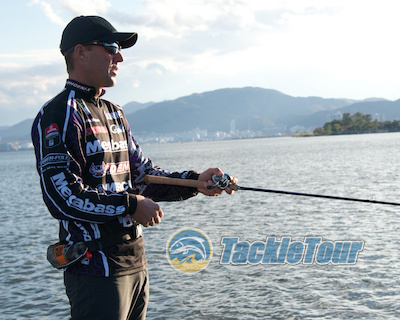 A.Martens: My go to cranking setup right now is the Megabass F4.5-711GTA Ultimate Cranking Stick matched with the new Shimano Metanium casting reel. Which version of that reel I'm using depends on what crank I'm using but in general I use fast reels either the 7.4:1 or the 8.5:1. I'd probably use the 7.4:1, but if it's a fast bite and I need to burn a crank, I'm using the 8.5:1. I like that reel for burning because it moves the bait effortlessly through the water and you don't have to spin your hand so fast. I can feel a lot more with a fast reel. I really like that Ultimate Cranking stick. It's a really good length with a soft tip and really strong backbone. I can launch baits a long ways because the rod is so long and there's plenty of power in the rod to stick fish no matter how much line you have out. Speaking of line, when I'm cranking I use mostly Sunline Sniper between ten to fourteen pound test. If I'm fishing trees and grass, I'll switch to 20lb SX Braid because I have better control of my bait in areas where there's high potential for hangups. With braid, if I get hung, I can usually just pull my bait right out of snag. It's more efficient to do that rather than run up and trying to free your bait. But if I need to get down deep, 'm using the fluorocarbon. For soft plastics, Martens likes the Double X F7-72XX Perfect Pitch. When fishing vertical applications, Martens relies on Sunline Shooter for better sensitivity and superior abrasion resistance.